1. Department of Breast Oncology, Sun Yat-Sen University Cancer Center, State Key Laboratory of Oncology in South China, Collaborative Innovation Center for Cancer Medicine, Guangzhou, China. 2. Department of Anatomy, Medical College, University of South China, Hengyang, Hunan Province, China. 3. Department of Radiotherapy, The First Affiliated Hospital, University of South China, Hengyang, Hunan Province, China. * B. Chen, D. Dai and H. Tang contributed equally to this work. Background: Serum parameters as prognostic parameters are studied widely. We aim to examine the prognostic significance of the serum alkaline phosphatase (ALP) level and lactate dehydrogenase (LDH) level in triple negative breast cancer (TNBC). 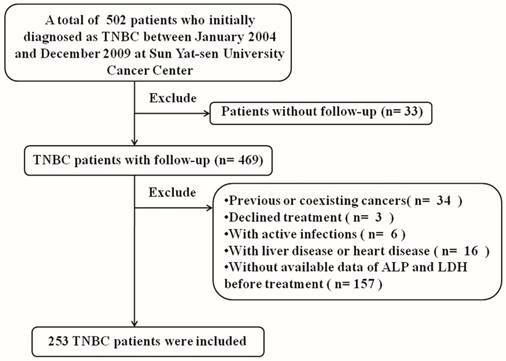 Methods: Total of 253 TNBC patients from Sun Yat-sen University Cancer Center who underwent treatment between January 2004 and December 2009 was conducted in this retrospective study. Before treatment serum ALP and LDH levels were routinely measured. We use the receiver operating characteristic (ROC) curve analysis to estimate the cutoff value of serum ALP and LDH levels. The Kaplan-Meier method and multivariable Cox regression analysis were used for Disease free survival (DFS) and overall survival (OS) assessed. Results: The ROC curves determined that the optimum cutoff point for ALP and LDH were 66.5u/L and 160.5u/L, respectively. The elevated ALP and LDH were both significantly associated with decreased DFS and OS (both P < 0.001). In addition, the entire cohort was stratified into three subgroups basis of ALP levels and LDH levels. TNBC Patients who with ALP >66.5 u/L and LDH >160.5u/L had the worst DFS and OS (both P < 0.001). In TNBC patients, univariate and multivariate Cox regression analyses conformed ALP and LDH were independent unfavorable prognostic factors for DFS and OS. Conclusions: The serum levels of ALP and LDH before treatment are independent prognostic parameters and may serve as complement to help predict survival in TNBC. Keywords: Alkaline phosphatase, Lactate dehydrogenase, Triple negative breast cancer, Prognostic factor, Biomarker. Cancer is an increasingly global problem and breast cancer is the main cause of cancer death in women worldwide[1, 2]. It is generally known that breast cancer has various genetic alterations and it to be classified into different molecular subtypes. As a refractory subtype of breast cancer, Triple negative breast cancer (TNBC) is a heterogeneous clinicopathological cancer and shows high recurrence rate and poor prognosis. About 15% to 20% breast cancer patients are TNBC. It has attracted increasing clinical and basic scientific research attention on the prognostic factors for patients with TNBC. A valuable prognostic factor should be accurate and reproducible, but also easily performed. In recent years, many studies focus on blood parameters and serum parameters that may be prognostic parameters in cancer. An increasing body of evidence has confirmed the utility of blood parameters and serum parameters in predicting TNBC patient prognosis. For example, increased pre-treatment neutrophil to lymphocyte ratio (NLR) may be associated with poor prognosis in early TNBC patients . The high fibrinogen level before operative was a risk factor for triple negative breast cancer and some other breast cancer subtypes. . Here, we concern about two routinely tested serums biochemical index alkaline phosphatase (ALP) and lactate dehydrogenase (LDH). ALP is a hydrolase enzyme which responsible for removing phosphate groups. LDH plays a vital role in the conversion of pyruvate to lactate. Both of them are serum enzymes, which have been found to have prognostic value in several malignancies. According to previously studies, in some kinds of cancer, the elevation of ALP or LDH might indicate a heavy tumor burden and tumor metastasis. High ALP level was reported to be related with worse prognosis in colorectal cancer , nasopharyngeal carcinoma , prostate cancer, and esophageal squamous cell carcinoma. Serum LDH level was demonstrated to be a prognostic factor in nasopharyngeal carcinoma, lymphoma, small cell lung cancer, myeloma and prostate cancer. However, the prognosis value of serum ALP and LDH in TNBC has remained unclear. In this retrospectively study, we evaluated serum ALP and serum LDH levels in 253 TNBC patients, and correlated the levels of ALP and LDH to the outcomes of the TNBC patients. This study was conducted female patients who with histological diagnosed of triple-negative breast cancer between January 1, 2004 and December 31, 2009 in Sun Yat-sen University Cancer Center (SYSUCC). TNBC was defined as breast cancer with negative expression of Estrogen receptor (ER-), progesterone receptor (PR-), and human epidermal growth factor receptor 2 (HER-2-). ER, PR, and HER-2 analyses were performed via immunohistochemistry (IHC). ER- or PR- was defined as less than 1% of positive ER or PR expression cells. Because lacking of fluorescence in situ hybridization data, HER-2 immunohistochemical scores of 0/1+ were including as HER-2 negative. A Patient was excluded from the study: 1) without follow-up; 2) with previous or coexisting cancers; 3) Declined treatment; 4) with active infections; 5) with liver disease or heart disease; 6) without available data of ALP and LDH before treatment. All patients were followed up to November 27, 2015 or until death. Sun Yat-sen University Cancer Center Institute Research Ethics Committee approved this retrospective study, and all enrolled patients had written informed consent. The methods were in accordance with the approved guidelines. Before patients received prior treatment, baseline serum ALP and LDH had been routinely determined by Hitachi Automatic Analyzer 7600-020 (Hitachi, Tokyo, Japan). Clinical and histopathological data were collected through database chart review. Disease staging were determined according to the American Joint Committee on Cancer (AJCC) 7th Edition by TNM staging system. Patients were followed up by the Follow-up Department through outpatient medical records or telephone. A P value of <0.05 was considered statistically significant. SPSS for Windows version 20.0 (SPSS, Chicago, IL, USA) was used to analyze all of the statistical data. Optimal cutoff values for the ALP and LDH were calculated by applying receiver operating curve (ROC) analysis. Univariate analyses with the Chi-squared test or Fisher's exact test were performed to investigate the associations of ALP or LDH level with clinicopathologic variables. Overall survival (OS) and Disease-free survival (DFS) were calculated from the initial treatment. Survival curves were calculated by the Kaplan-Meier and compared with the log-rank test. Univariate and multivariate analyses (Cox proportional hazards regression model) examined prognostic factors. Variables which P<0.05 in the univariate analysis were entered into the multivariate analysis. We identified 502 female patients who were histopathologically diagnosed TNBC in SYSUCC. 253 female patients were enrolled after eligibility review. The reasons for the excluded patients are summarized in Fig.1. The median age of these patients was 47 years (range, 22-79 years), and their median follow-up time was 89 months (range, 2-143 months [censored]). At the end of this study, 45.8 % (116/253) of the patients experienced local/distant recurrence, and 43.1 % (109/253) died. Invasive ductal carcinoma was the predominant type (93.3%). Only 12 patients (4.7%) were diagnosed with invasive lobular carcinoma and 5 patients (2.0%) were diagnosed with intraductal carcinoma in situ. Of 253 consecutive patients, all of them received surgical treatment. 231 patients (91.3%) received neoadjuvant/ adjuvant chemotherapy and 54(21.3%) patients received radiotherapy. Using the overall survival as an endpoint, the optimal cutoff value of pre-treatment serum ALP and LDH level were determined by ROC curve analysis. The area under the ROC curve was 0.602(95%CI, 0.531-0.673) for ALP and 0.635 (95%CI, 0.565-0.705) for LDH (Fig.2). With the highest Youden's index, the cutoff point for pre-treatment serum ALP and LDH levels were 66.5u/L and 160.5u/L, respectively. Then, 76 patients (30.0 %) with ALP>66.5 u/L and 177 patients (70.0 %) with ALP≤ 66.5 u/L were classified into an ALP-high and ALP-low group, respectively. Meanwhile, by the cutoff point for LDH, 132 patients (52.2%) were classified into a LDH-high group (LDH>160.5u/L) and 121 patients (47.8%) were classified into a LDH-low group (LDH≤ 160.5u/L). To our best knowledge, this is the first report looking specifically at the predictive value of ALP and LDH in TNBC. The flow chart of patient selection. Correlations between pre-treatment serum ALP or LDH level and clinicopathological parameters are shown in Table 1. An obvious difference between ALP -high group and ALP -low group in the age, menstrual status (both P < 0.001) and lymph node (LN) Infiltrated (P = 0.001); No significant difference in the Body Mass Index (BMI), tumor size, tumor status, TNM staging, LN Infiltrated and histological grade (P > 0.05). At the same time, we found that a higher level of LDH was related to the age, menstrual status (both P < 0.001), BMI (P =0.007) and LN Infiltrated (P = 0.001). No correlation was observed between LDH level and other clinical characteristics (P > 0.05). A Kaplan-Meier survival analysis was conducted to analyze the significance of ALP and LDH in terms of clinical prognosis, (Table 2). Expectedly, the results showed that the ALP-high group patients presented shorter mean months of DFS and OS than the ALP -low group patients (P <0.001 for DFS; Fig. 3A, P <0.001 for OS; Fig. 3D). We also observed that higher level of LDH was associated with a lower disease-free survival rate and a lower overall survival rate (P <0.001 for DFS; Fig. 3B, P <0.001 for OS; Fig. 3E). In addition, we divided the patients into following three subgroups on the basis of ALP levels (≤66.5 u/L or >66.5 u/L) and LDH levels (≤160.5u/L or >160.5u/L). Group I: ALP (≤66.5 u/L) and LDH (≤160.5u/L) both in a lower level, Group III: ALP (>66.5 u/L) and LDH (>160.5u/L) both in a higher level, and the rest of patients all in Group II. There were 102 (40.3 %), 94(37.2 %), and 57 (22.5 %) patients were classified into the three groups respectively. Among the three groups, in group III, patients with a higher level of ALP and LDH had the worst DFS and OS. These results indicated that the pre-treatment serum ALP and LDH levels were significantly associated with the TNBC patients DFS and OS (P <0.001 for DFS; Fig. 3C, P <0.001 for OS; Fig. 3F). Based on above analyses, high ALP and high LDH levels were significantly associated with a higher recurrence and mortality in TNBC. Next, in Univariate Cox proportional hazard regression analysis revealed that tumor status, lymph node metastasis, histological grade, ALP levels and LDH levels were predictive factors of prognosis for DFS and OS in TNBC patients. Multivariate regression analysis confirmed that tumor status, lymph node metastasis, ALP levels (HR 1.826(95 % CI 1.179-2.828), P=0.007 for DFS and HR 1.772(95 % CI 1.164-2.698), P=0.008 for OS) and LDH levels (HR 1.577(95 % CI 1.027-2.422), P=0.038 for DFS and HR 1.700(95 % CI 1.126-2.567), P=0.012 for OS) were independent prognostic factors (Table 3). TNBC is a diverse and heterogeneous group of breast cancer simply defined by the absence of ER, PR and HER2 amplification. Besides the TNM stage, tremendous studies have been carried out on identifying reliable prognostic factors in TNBC. In recent years, some studies have demonstrated the prognostic value of blood parameters and serum parameters, which are inexpensive, accurate, identified by easy method of detection and validated. Although underlying mechanism is unclear, increased pretreatment blood parameters and serum parameters have been confirmed to associate with prognosis of several cancers, such as neutrophil-to-lymphocyte ratio (NLR)[17, 18], lymphocyte-to-monocyte ratio (LMR), monocyte count, platelet-to-lymphocyte ratio (PLR), fibrinogen haptoglobin and C-reactive protein. The serum levels of ALP and LDH are routine diagnostic tests in clinical laboratories. In this paper, we focus on the pre-treatment serum ALP and LDH levels and explore the prognostic value of them in TNBC patients. The cutoff value of the pre-treatment serum ALP and LDH levels. Notes: ALP with an AUC of 60.2% (sensitivity of 41.3% and specificity of 78.5%); LDH with an AUC of 63.5% (sensitivity of 67.0% and a specificity of 59.0%). Abbreviations: AUC, area under the curve. 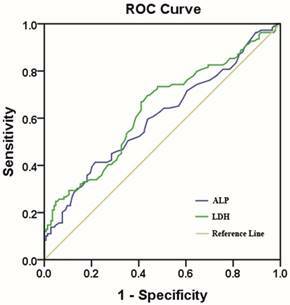 Correlation between the clinicopathological variables and ALP or LDH in triple negative breast cancer cases. Abbreviation: ALP alkaline phosphatase, LDH lactate dehydrogenase, BMI body mass index, LN lymph node. The DFS and OS of TNBC patients according to levels of ALP, LDH, and ALP&LDH. Prognostic value of the pre-treatment serum ALP and LDH levels in triple negative breast cancer patients. (A and D) TNBC patients with a higher level of pre-treatment ALP had a worse disease-free survival and overall survival than patients; (B and E) TNBC patients with a higher level of pre-treatment LDH had a worse disease-free survival and overall survival; (C and F) Group III patients(ALP>66.5 u/L and LDH>160.5 u/L) had the worst prognosis. ALP is a nonspecific enzyme whose total serum levels reflect the combined activity of several isoenzymes found in the liver, kidney, intestinal lining and bone. An electron microscopic cytochemistry study showed that in nucleolar localization ALP could indicate proliferation . During the cell cycle, in the nucleolus of cancer cells, ALP activity higher and changes in localization . Von Hoof et al. and Steiber et al. found that in non-metastatic breast cancer there are no significant differences in ALP levels. However, others have found a significant rise in ALP in metastasis . Recent small-scale studies suggested that a significant increase in serum ALP was observed in breast cancer patients [30, 31] and it has consistently been shown to predict liver metastases and bone metastases[33, 34]. It was widely recognized that a shift to aerobic glycolysis is a hallmark of most cancer cells. LDH is a metabolic enzyme which catalyzes the interconversion of pyruvate and lactate. LDH level is increased during some important pathological process such as tissue injury, hypoxia and necrosis. In addition, various cancer cells express a higher LDH level than normal cells and the elevation of LDH might influent the tumor metabolism and microenvironment which may promote tumor progression . Thus, the potential role of LDH as a prognostic biomarker in oncology has long been recognized [35, 37, 38]. A higher level of LDH is significantly associated with poor survival in terminal cancer patients which confirmed by several studies. [39, 40]. In bisphosphonate-treated breast cancer patients, an analysis demonstrated that LDH levels correlate with survival in patients with bone metastases . In Previous researches, it was strongly indicated the valuable prognostic roles of ALP and LDH in cancer. However, little is known about the ALP and LDH prognostic value in TNBC patients. In the present study, we applied receiver operating curve (ROC) analysis to calculate optimal cutoff values for the pre-treatment serum ALP or LDH level. With the highest Youden's index, the cutoff values of ALP and LDH in the present study were 66.5 u/L and 160.5u/L, respectively. Then, through clinical pathological features analyzing, we discovered that both of ALP and LDH expression levels were related to the age, menstrual status and LN Infiltrated. Meanwhile, LDH also associated with BMI. 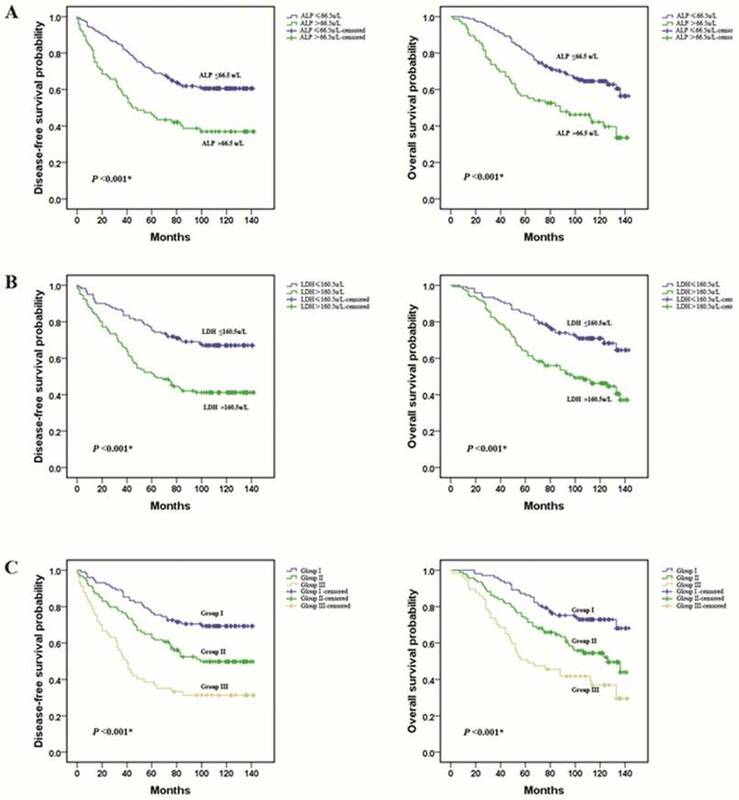 In survive analysis, we examined the prognostic value of pre-treatment ALP and LDH to predict the long-term outcome of TNBC patients and found that ALP and LDH were independent predictors for DFS and OS. What's more, patients with ALP >66.5 u/L and LDH>160.5u/L had the worst DFS and OS. Univariate and multivariate regression analyses confirmed ALP levels and LDH levels were independent unfavorable prognostic factors for DFS and OS in TNBC patients. Synthesize the above results, this study currently represents the first one evaluating the prognostic value of pre-treatment ALP and LDH levels in TNBC patients. We must acknowledge that there are several limitations in our analysis which connected to its retrospective design. First, the data were obtained from a single institution. In addition, there may have been a lack of uniformity because enrolled patients not received a unified treatment which may influence patients' survival. In recent studies, depending on the gene expression profile, TNBC can be classified into seven subtypes and the different subtypes are different sensitivities to treatment [42, 43]. Further prospective studies are therefore warranted to confirm these preliminary results and to investigate the correlations between TNBC subtypes and the serum levels of ALP and LDH. In conclusion, our present study demonstrated that the pre-treatment serum ALP and LDH levels are independent prognostic factors for predicting the outcomes for TNBC patients. It may help clinicians to assess the risks of relapse and death in TNBC patients. In the future, the value and the most sensitive cut-off points of serum ALP and LDH required large clinical trials to determine. ALP, alkaline phosphatase; LDH, lactate dehydrogenase; TNBC, triple negative breast cancer; ROC, receiver operating curve; DFS, disease-free survival; OS, overall survival; NLR, neutrophil to lymphocyte ratio; ER, estrogen receptor; PR, progesterone receptor; Her 2, human epidermal growth factor receptor 2; IHC, immunohistochemistry; AJCC, American Joint Committee on Cancer; TNM, tumor node metastasis; LN, lymph node; BMI, body mass index; HRs, Hazard ratios; CIs, confidence intervals; AUC, area under the receiver operating curve. This work was supported by funds from the Science and Technology Planning Projects of Guangdong and Guangzhou (2013B060300009, 2015B020211002, 2014A020212079 and 2015B090901050 to X. Xie; 2013B021800072 to W. Wei; 2014J4100169 to H. Tang), the Guangdong Natural Science Foundation (S2012010008521 to W. Wei) and the National Natural Science Foundation of China (81272514, 81472575 and 81372133to X. Xie; 81472469 to H. Tang). Corresponding authors: Xiaoming Xie and Weidong Wei, Department of Breast Oncology, Sun Yat-Sen University Cancer Center, 651 East Dongfeng Road, Guangzhou, 510060, People's Republic of China; Phone: 86-20-87343806; Fax: 86-20-87343805; E-mail: xiexmorg.cn, weiwdorg.cn.